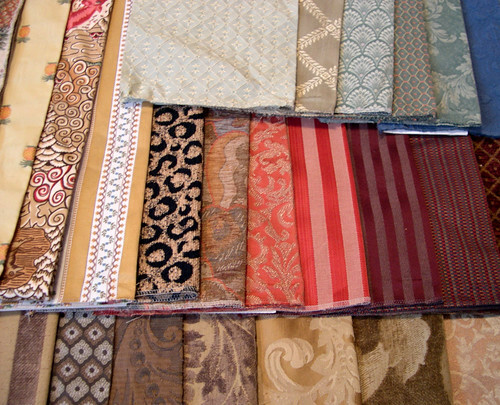 A few months ago, I scored these samples of discontinued decorator fabric. Just the right size to have enough for a project, but not so much that i feel intimidated about using it! Some of them were marked at 75$ a yard! At Linens n Things I found some Nautica down throw pillows marked down from 45 dollars to five bucks! I snatched up all that were left - five. The covers were ugly, but it's what's inside that counts, right? I took those babies home and whipped up some cute new patchwork covers with my fancy schmancy decor fabric! In case you were wondering, yes that is my $50 yard sale leather couch! The only bummer about down throw pillows is that you have to keep fluffing them back into shape because of the compress and get all wonky when you use them! But I love them! I was so pleased with the results that I have been sewing more since then! I made a shower curtain ( to look cute in our newly repainted pink bathroom!) and a dog bed cover. Photos of those sewing projects and bathroom redeco soon! It's good to be crafty!